Master Sgt. Jocelin Borisow, from the “Wounded Warriors” short film about Jonathan Davis’ visit to Ramstein Air Base and Landstuhl Regional Medical Center, Germany. Twice in 2012, Jonathan Davis, lead singer for the band Korn, visited with U.S. troops and wounded warriors in Germany due to the efforts of Master Sgt. Jocelin Borisow. During Davis’ second trip in August, Borisow served as producer of a short film showing Davis meeting with troops recovering from their wounds at Landstuhl Regional Medical Center. It is important for Borisow that the American people show wounded warriors the respect they deserve, even if they don’t support the war. 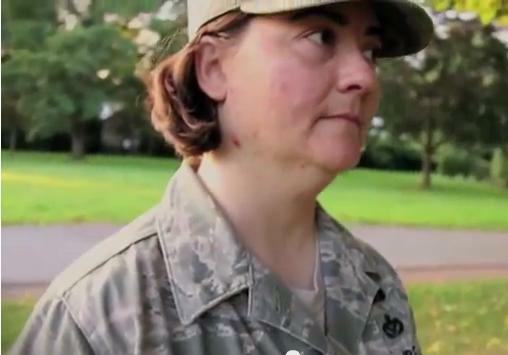 In one incident that stands out in Borisow’s memory, an anti-war protester spat at her and other troops in 2004. “I’ve been through that and I would not want these wounded warriors – these heroes – coming back to something like that,” she said.